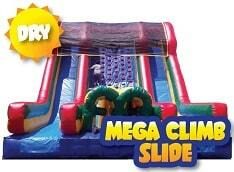 Perfect for large outdoors events, this 22ft Dual Lane Wall Climb and Slide offers a thrill-filled day and keeps the kids climbing and sliding. This bright and colorful red-yellow-green-blue scheme fits into any decor. Throughput: 320 participants per hour. Minimum space: 38L x 25W x 22H. Electrical outlet(s): 2 - Generators are required for Park/Fields.